The magnificent Cairngorms are a magnet for walkers and, from high mountain tops to refreshing forest trails, the granite plateau and surrounding countryside has something for everyone. For the more experienced, the summits beckon. The area contains four of Scotland's eight 4000 footers and, while Derry Cairngorm is not one of them, it offers spectacular views to the high peaks and an uncomplicated ascent and descent from Linn of Dee, near Braemar. Wildlife in the area includes red deer, mountain hare and foxes with red squirrels and pine martens to be found in the belts of Scots Pine which carpet the lower slopes. Ptarmigan, dotterel and capercaillie are among the area's birdlife. Set off from the public car park at Linn of Dee, following a path signed for Derry Lodge. This climbs through woodland, dropping down to cross wooden boardwalks over a burn and bog. It rises again to a high kissing gate at the edge of the trees. Turn left here and head north on a wide sandy track over open ground, with the River Lui to the right. A mile on, the track descends to a wooden bridge across the river. Cross it, bear left and follow the way up Glen Lui to Derry Lodge. 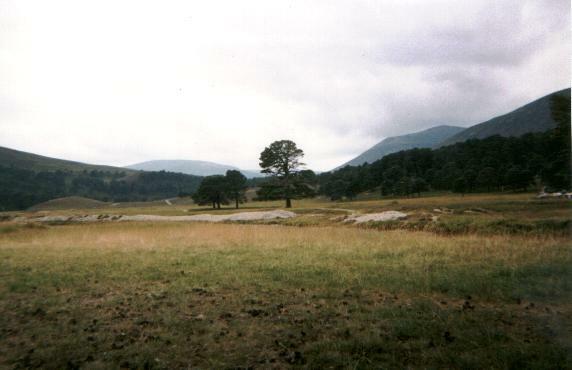 The track undulates gently, with Derry Cairngorm in view ahead. As you approach the derelict lodge, the track enters a small woodland of Scots Pine. It skirts by the substantial stone building - windows boarded up - before dropping to a brown wooden hut used by the local mountain rescue team. Beyond this is a footbridge over the Derry Burn. Over the bridge, kept left. Do not take the main path up Glen Derry but aim for the steep slope ahead of you, climbing the south-east flank of Carn Crom. There are a couple of stiles to negotiate before you emerge on to open hillside, the path winding through crags before finally flattening off. Continue north-west over open hillside and the path skirts right of Carn Crom's summit, picking a course around the steep east face of the hill. 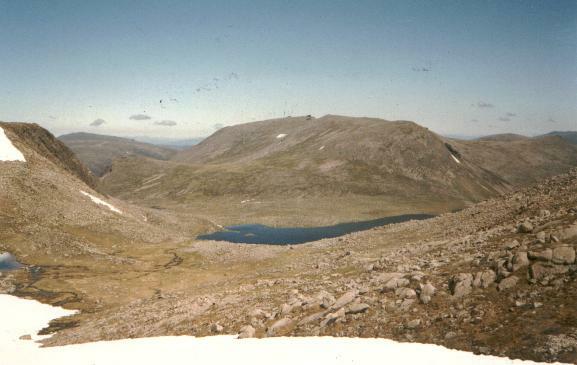 The way reaches a col above Coire na Saobhaldh, south of Derry Cairngorm, which is visible ahead, although the actual summit is hidden behind a lower peak. The path heads north over the bare open hillside, rising to rocky ground. It then climbs to the outlying top where the summit soon looms into view. The path drops briefly, then picks a course through smooth boulders to reach the top, marked by a cairn. It's a fine viewpoint with panoramas over craggy coires to neighbouring Ben Macdui and the summits of Cairn Toul, Braeriach and the Devil's Point to the west. Cairn Gorm sits to the north beyond Beinn Mheadhoin, while Beinn Bhreac is immediately east across deep Glen Derry. You can return by the route of descent. However, an alternative option is to continue north over the summit of Creagan a'Choire Etchachan, dropping to the east end of Loch Etchachan. A path then descends from the high lochan, dropping quite steeply beside the burn to the Hutchison Memorial Hut, an open mountain bothy. Continue down to a junction of paths just beyond a wooden bridge over the burn down in the base of the valley. Follow the path south from here down Glen Derry, passing through a fenced enclosure where efforts are being made to regenerate the area's natural woodland, protected from grazing sheep and deer. Two miles on from the junction, a path leaves the track and crosses a footbridge over the river. It continues through woodland, returning to the footbridge by Derry Lodge. Retrace your steps from here through Glen Lui to the Linn of Dee. Map OS Landranger sheet 36 or Harveys Cairn Gorm. Start/parking Linn of Dee. GR: 064898. Grading A long day suitable for fit and experienced hill walkers. There is track and path throughout. In winter ice axes and crampons and the knowledge to use them properly are a must.